Bosses and subordinates have a very specific type of relationship, with a major impact on how well the two collaborate together over time. The decisive factor modeling this relationship is often thought to be the personal style of the manager. However, observation of team interactions shows that there are as many types of boss-subordinate relationships as there are people. 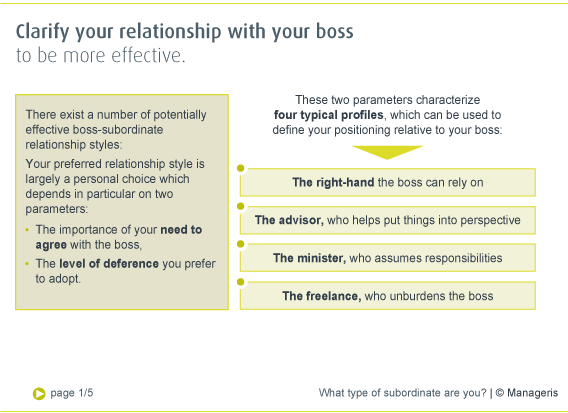 Indeed, individual personality, active or passive mindset, convictions and expectations, and habits formed with previous bosses are all factors which greatly influence how a subordinate relates to his current boss. Many misunderstandings between bosses and subordinates arise from a lack of a shared sense of responsibility for the hierarchical relationship, as shown by the example of Christopher, regional head of a large industrial firm: “I just don’t understand it. My sales record is excellent. I shoulder all the problems. My boss doesn’t even hear about them most of the time! My teams are motivated and autonomous. They compete for the opportunity to take initiative. Despite all this, things are really tense between me and my boss. He always appears on edge and doesn’t seem to trust me.” Christopher is acting in accordance with what he assumes a boss expects from his subordinates, e.g., autonomy, performance, etc. What he does not see is that his boss’s objectives are somewhat different. The boss not only naturally wants Christopher to perform well in terms of sales, but also to participate in continuous improvement efforts by sharing best practices. But Christopher doesn’t give the boss a lot of visibility on this aspect. Moreover, the boss – by virtue of his personal management style –prefers to hear about problems as they arise rather than risk discovering them too late. So rather than being delighted that problems are being solved without his even knowing about them, he is feeling increasingly frustrated and anxious. This example demonstrates how difficult it is for bosses and subordinates to establish a constructive relationship, even when both sides have the best of intentions. That is why this relationship must be actively managed. How to manage the relationship with your boss in a proactive way?